Press inquiries contact us here. New iOS app brings affordable integration of 3D Face Scans into Dental Software. Campbell, CA, March 9, 2019: Bellus3D, Inc. a Silicon Valley computer vision company announced today that it is introducing new 3D face scanning applications and add-on software modules for the dental market. The new software will be demonstrated at the 2019 International Dental Show (IDS) in Cologne, Germany, March 12-16, 2019. Three-dimensional Face scanning has become a highly desirable visualization tool to aid dentists, orthodontists, laboratories and oral surgeons in case planning and presentation to patients. When a 3D face scan is matched to intraoral and 3D Cone Beam (CBCT) scans, dental professionals can visually present before/after simulations to their patients for improved acceptance of proposed treatments. This integration improves collaboration and information exchange between patients, practitioners and dental labs. While highly desirable, 3D face scanning has not been widely adopted into dental practices due to cost and complex integration challenges. Previously, obtaining a 3D face scan has required very expensive, specialized, and cumbersome equipment to move a 3D scanner around the subject to capture them from different directions and can take several minutes. The technology developed and now patented by Bellus3D only requires the user to turn their head in a guided sequence using commonly available 3D-enabled mobile phones or devices connected to the Bellus3D Face Camera Pro USB Camera Accessory. The introduction of Bellus3D’s newest dental solutions brings a breakthrough in affordability and ease-of-use to the dental ecosystem and improves common dental work flows. At the 2019 IDS tradeshow, Bellus3D is announcing two products. Bellus3D Face App Pro is a new dental app for Apple iPad Pro and iPhone X. The new app uses the built-in TrueDepth Camera of these devices to scan and reproduce a user’s 3D face in under 15 seconds. Once the scan is complete, the newly integrated Bellus3D dental function automatically performs lip-line cutting and registers the 3D face scan with either dental STL arch files or a CBCT scan. By mapping the 3D face scan to these targets, the time consuming and error prone process of manual alignment and lip line cutting between 3D face scans and dental scans is greatly reduced or eliminated. The auto-registration process allows the 3D face scans to be imported into dental design software for immediate use. The second product being presented is the Bellus3D Add-on Module for exocad. The new add-on allows direct launching of the Bellus3D Face Camera Pro USB camera accessory from a PC running exocad ChairsideCAD or DentalCAD software. Through the exocad integration, operators initiate a 3D face scan of their patient with normal and exaggerated smiles. The import process will automatically perform lip-line cutting while orienting and aligning the 3D face scan with the intraoral scan. Live demonstrations of both products are being shown at the International Dental Show in Cologne, Germany, March 12-16, 2019, USA Pavilion, Hall 5.2, Booth E-099. Bellus3D (www.bellus3d.com) is the innovative leader in high-resolution 3D face scanning and face ID technology designed for mobile platforms. 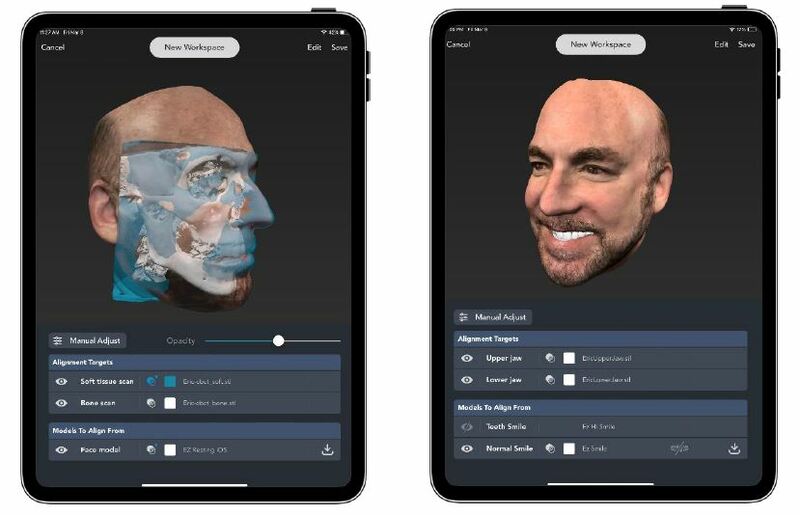 New Bellus3D FaceApp Pro scans a user’s full head in 3D for personalized products in dental, eyewear, custom figurines and entertainment industries. Las Vegas, NV, January 3, 2019: Bellus3D, Inc. a Silicon Valley startup formed by leading computer vision experts, is previewing Bellus3D FaceApp Pro, a professional version of its iOS FaceApp application that can now scan a user’s full head in 3D using a mobile device. Bellus3D FaceApp Pro was developed in response to the market demand by dental and eyewear professionals seeking to personalize the design and presentation of products and services for their clients. FaceApp Pro captures a lifelike representation of the user’s face in 3D in under 15 seconds with proprietary patented technology. At CES 2019, FaceApp Pro is being demonstrated on the new 11-inch and 12.9-inch Apple iPad Pro models that incorporate the TrueDepth Face ID camera. Dental professionals specializing in smile design want to create excitement and approval from their patients when proposing smile reconstruction through the use of implants, veneers, invisible aligners or traditional orthodontic brackets. FaceApp Pro can export a 3D model of a patient’s face in file formats compatible with most dental software systems and enables dental professionals to present a high-fidelity 3D interactive “before and after” simulation of a patient’s smile. The global orthodontics market is estimated to reach $5.9 billion dollars by 2023. Personalized design and custom fitting of eyewear is an emerging trend in the $177B global eyewear market estimated for the year 2023. With Bellus3D FaceApp Pro, opticians and eyewear brands are offering customers a range of personalized products customized for the exact dimensions of customer’s face ranging from bespoke designs, automatic best fit, and virtual try-on. “Professional service providers have specialized features and customer management requirements that are not offered in our original consumer app. 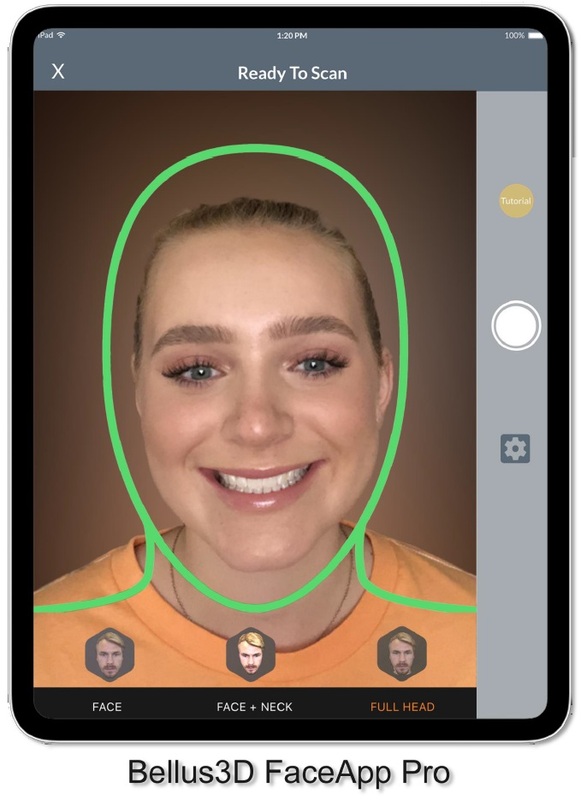 We designed the new FaceApp Pro to meet the needs of professionals incorporating 3D face scanning into office and clinical environments.”, said Eric Chen, CEO of Bellus3D, Inc. The company is showcasing solutions of third-party developers who have integrated Bellus3D technology into their products, including dental solutions from 3Shape Dental System 2018, DSD App by Coachman and AFT Dental System; and personalized eyewear solutions from Italian eyewear design firm Thema Optical and custom swim goggle maker The Magic5. Bellus3D’s new offering for consumers is the new Bellus3D Marketplace for purchasing 3D figurines and engraved crystal products. The Marketplace is built into the latest release Bellus3D FaceApp for iPhone X, available for free download from the Apple App Store. Users of this application can purchase 3D figurines and bobble heads that incorporate the user’s face into a wide assortment of sports, professional and holiday themed figures. Bellus3D FaceApp Pro will be available for trials starting in February 2019. In addition to FaceApp Pro, Bellus3D is also demonstrating their USB Face Camera Pro for Android and Windows at the CES in Las Vegas, Nevada Jan. 8-11, 2019 in the LVCC, Tech East, South Hall, Upper Level, Booth 32032. Bellus3D (www.bellus3d.com) is the innovative leader in high-resolution 3D face scanning and face ID technology designed for mobile platforms. The company is a venture-backed Silicon Valley startup founded in March 2015 by leading computer vision experts to bring the next generation of face scanning technologies to worldwide markets. Newly issued patent recognizes the company's unique innovation for 3D selfie face scanning. Campbell, CA, January 3, 2019: Bellus3D, Inc. a Silicon Valley startup formed by leading computer vision experts, announced today that the U.S. Patent and Trademark Office granted the company a new fundamental patent that covers key aspects in 3D selfie face scanning user interface and implementation. The new patent (U.S. Patent No. 10,157,477) issued on December 18, 2018 describes the company’s original invention of a self-scanning method that automatically detects a user’s head position and orientation and guides the user to turn their head in a directed sequence over a wide range of angles resulting with a 3D face model produced from a composite collection of color photo and 3D depth captures. It is a basic patent that recognizes the company’s unique invention that enables non-technical users to capture a 3D selfie. Three-dimensional face scanning is a breakthrough technology enabling the personalization of products and services that utilize the unique 3D shape of each human’s face. The customization and personal design of products is emerging as an important trend towards developing customer loyalty which leads to increased profitability. Examples of face-based product customization include custom designed eye glasses, custom fitting beauty masks, cosmetic surgery simulation, personalized 3D figurines, and immersive entertainment experiences placing the user’s real face in video games and movie clips. Previously, obtaining a 3D face scan has required very expensive, specialized, and cumbersome equipment to move a 3D scanner around the subject to capture them from different directions and can take several minutes. The technology developed and now patented by Bellus3D only requires the user to turn their head in a guided sequence using commonly available 3D-enabled mobile phones. Issuance of the patent reflects the importance of the company’s intellectual property portfolio representing its early and on-going development in this field. This is the 18th patent issued to the company’s co-founder Eric Chen. Bellus3D is currently shipping 3D face scanning solutions for Apple iOS, Android, and Windows platforms. The Bellus3D FaceApp is a 3D face-scanning application for Apple iPhone X models that include TrueDepth/Face Id cameras. Android and Windows platforms are supported by the Bellus3D Face Camera Pro USB Camera Accessory. Bellus3D (www.bellus3d.com) is the innovative leader in high-resolution 3D face scanning designed for mobile platforms. Bellus 3D Face Camera: Step Up The Selfie Game By Clicking Accurate 3D Selfies!